Those who are familiar with the modern shooting technique understand the concept of "stand and deliver." This is the tactic of the good guy, upon seeing a lethal threat, immediately and rapidly drawing his pistol and placing effective fire on the bad guy — before the bad guy can react. Action versus reaction — we've all heard it, but is it true? Unfortunately, there is a fundamental flaw with this technique: In reality, your action will not beat the reaction. One of the drills we do in Airsoft-based force-on-force training is for each student — one with his Airsoft pistol drawn, the other drawing his pistol — to both attempt to shoot each other while standing in place. In the drill, each student shoots the other with a little plastic pellet; however, this is not what happens in real life. Advanced shooter: Has studied the modern technique for 30-plus years, is an IDPA Master (BUG), attended close range gunfighting and force-on-force courses, and is an affiliated instructor with Suarez International. Intermediate shooter: Has attended a couple of modern technique classes and is an IDPA Expert. Somewhat-trained shooter: Has attended no formal instruction and is an IDPA Marksman. Untrained shooter: Has had no formal instruction and only limited experience drawing and firing a pistol from the holster. The experiment has two shooters standing side-by-side, facing down range, one drawing and shooting a target 3 meters away. The shooter drawing from the holster (good guy) starts with his hand on the pistol grip, draws his pistol when he chooses and fires one shot at the target. The other shooter (bad guy) starts with his pistol out and aimed at the head of a target (also 3 meters away), reacting and firing when he sees (using peripheral vision) the good guy draw his pistol. In 98 out of 100 trials, the bad guy fired and hit first. Only once did both shooters fire simultaneously, and only one time did the good guy fire first. We used a video camera at 60 frames per second to time the movements. We measured the draw time starting with the first frame indicating upward movement of the pistol from the good guy's holster and ending with the first frame indicating that the shooter has fired. 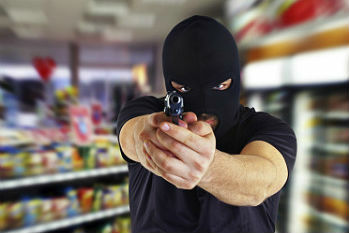 We measure the bad guy's shot as the first frame indicating the bad guy is firing his pistol (e.g. bullet has departed the barrel, pistol is unlocking, etc.). Some numbers: The average draw time for all shooters starting with their hand on the pistol was .372 seconds. The fastest draw time recorded was .300 seconds while the slowest draw time recorded was .479 seconds — all draws in less than half a second. The advanced shooter recorded the fastest draw time, while the basically untrained shooter recorded the slowest. The average reaction time for all bad guy shots was .279 seconds; the fastest reaction time we recorded was .133 seconds, and the slowest reaction time was .383 seconds. The intermediate shooter recorded the fastest reaction time while the basically untrained shooter had the slowest. Observers of our experiment often thought both shooters fired simultaneously; however, that was not the case. The shortest split time between the bad guy firing and the good guy firing was .017 seconds or 17/100s of a second. However, even in this short timeframe the good guy's finger was not on the trigger and his pistol was not yet on the target when the bad guy fired. Unlike Airsoft where both get hit with a little plastic pellet, in the stand-and-deliver mode, the good guy gets hit in the forehead with a bullet and never fires a shot in 98 out of 100 times. The bottom line to these numbers — if you attempt to stand and out draw your opponent and the bad guy is paying attention, then his pistol muzzle is likely the last thing you will ever see. So what's the solution? Move, draw and shoot — in that order. When I first began practicing the skills I learned in Close Range Gunfighting, I genuinely believed I was moving and then drawing and firing my pistol. The video proved I was not, and I discovered it takes some effort to overcome this tendency. Based upon our experiment, the time I was taking to begin my draw before I started moving would have likely resulted in me taking a bullet. This is a common training scar associated with those who have only received traditional square range training or (surprisingly) those regularly shooting IDPA. I believe IDPA courses of fire that require moving while shooting over a short distance encourage this bad habit. If you move first and then draw, you must slow down or you do not have time to fire the shots. One final word. 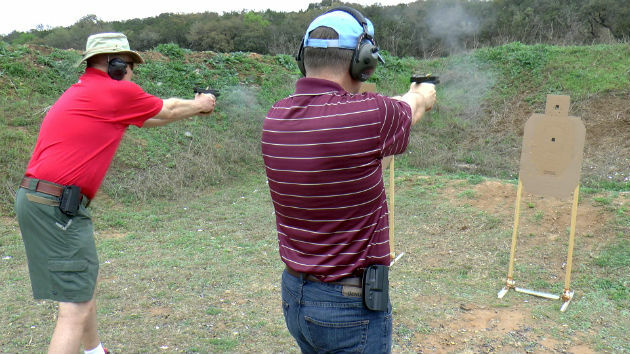 If you wish to replicate this experiment, ensure that your participants have the trigger finger discipline and skill to rapidly and safely draw their pistol. Newer shooters often place their finger on the trigger too early in the draw stroke and can end up with unintended discharges. Eric Lamberson is a retired Army officer and firearms enthusiast with 40-plus years of experience in using firearms for hunting, competition and self-defense. He is an IDPA 6-gun Master and has completed the Force Science Institute certification in force science analysis. Eric is a Texas LTC instructor, NRA Pistol, Massad Ayoob Group Staff instructor and currently teaches basic, intermediate and advanced levels of the modern technique, low-light skills, and is certified to teach the Suarez International close-range gun fighting and force on force curriculum. You can contact Eric at ericlamberson@sensibleselfdefense.com or visit his Sensible Self Defense website.